The most famous and holy expedition in India � Chardham Yatra allows the tourists exploring the four glorious shrines including Yamunotri, Gangotri, Barkot and Badrinath Dham. A visit to these holy shrines fills your life with optimum peace that you find in the distinct location of Himalayan foothills in Uttarakhand. The amazing valleys of these destinations proudly provide a welcoming destination to the pilgrims seeking serenity on their trip. 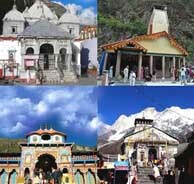 So, book this Chardham Yatra package on goaroundtours.com now! Note � AC Will not work in hills. Charges of palki, pony etc. After arriving at Delhi Airport / Railway Station / Hotel, you will meet our representative and further driven to Haridwar. On arrival, check-in to the hotel. In the evening, visit Har- ki-Pauri to witness Ganga Aarti. Later, return to the hotel for dinner and overnight stay. Enjoy breakfast, check-out of the hotel and drive to Barkot via Dehradun & Mussoorie. En-route pay visit to the Kempty Falls and other attractions and drive straight to your hotel for night halt. Overnight stay at the hotel. After breakfast, drive to Jankichatti / Phoolchatti from where the trek start to Yamunotri (6 KM). You can choose the options by walk or by horse or by Doli (at own cost). Arrival at Yamunotri, one can cook rice by packing it in a cloth and dipping it in the hot water of the hot Kund. Pilgrims take this cooked rice home as "Prasad" from here. Visit Yamunotri Temple, Surya Kund and Divya Shila. After taking bath in Jamunabai Kund's warm water and having "Darshan" of pious "Yamunaji", perform "Pooja" at Divya Shila. Later, drive back to Barkot. Overnight stay will be at Hotel. After taking breakfast, check-out of the hotel and get driven to Uttarkashi. Uttarkashi is located at the bank of River Bhagirathi. On arrival, check in hotel. In the evening, visit Vishwanath Temple. Return to the hote for night stay. Post breakfast, leave for Gangotri, en-route visiting picturesque Harsil village, River Bhagirathi and the most spectacular views of the Himalayas. Pay offerings at Gangotri temple (having Submerged Shivling) and Kedar Ganga Sangam. After Gangotri Darshan drive back to Uttarkashi. Overnight stay will be at Uttarkashi hotel. Check-out of the Uttarkashi hotel and drive straight to Guptakashi. En-route you can see the stunning River Mandakini at Tilwara. The Mandakini River comes from Kedarnath, (drive alongside the River to reach Guptakashi). On arrival, check-in at the hotel. Later, in the evening visit Ardh Narishwar Temple. Overnight stay will be at the Hotel. Check-out from the hotel of Guptakashi and drive to Sonparyag. From Sonparyag, the trek begin for Kedarnath (3584 mts) on foot or on by pony / Doli. Tour members are advised to carry personal medicines, heavy woolen, toiletries and clothes for an overnight halt at Kedarnath. Check-in to the hotel. Later, pay visit to the holy shrine of Kedarnath (Kedarnath Temple). The Kedarnath shrine is one of the 12 jyotirlingas of Lord Shiva. It is a scenic spot located, against the backdrop of the beautiful Kedarnath range. Overnight stay will be at the hotel. Early morning after Temple Darshan, check-out of the hotel and trek down to Sonparyag. Later, drive to Rudraprayag via Guptakashi. Check-in to hotel at Rudraprayag. Overnight halt. Rudraprayag is one of the Panch Prayag (five confluences) of Alaknanda River, the point of confluence of rivers Alaknanda and Mandakini. Check-out from Rudraprayag, drive to Badrinath via Joshimath. Check-in to hotel. Later, proceed towards Badrinath Temple for Aarti. Return to the hotel for overnight stay. Badrinath is one of the 'Four Dhams' and the most celebrated pilgrimage spots of the country. Tapt Kund: Natural thermal springs on the bank of the River Alaknanda, where it is a tradition to bathe before entering the Badrinath temple. Brahama Kapal: A flat platform on the bank of River Alaknanda. Here, Hindus perform propitiating rites for their deceased ancestors. Early morning, have bath in the Taptkund to take Darshan of Badrivishal. Brahamakapal is significant for Pinddan Shraddh of ancestors (Pitrus). There are other interesting sightseeing spot like Mana, Vyas Gufa, Maatamoorti, Charanpaduka, Bhimkund and the "Mukh" of the Saraswati River. Just within the three kms of Badrinathjee. Later, drive back to Rudraprayag via Joshimath. Joshimath is situated on the slopes above the confluence of the rivers Alaknanda and Dhauliganga. It is known that out of the four 'Maths' established by Adi Shankaracharya, Joshimath is the winter seat of Badrinath. The idol is brought down to Joshimath and installed in the temple for people to worship. Check-in to the hotel for dinner and overnight stay. After having breakfast, get driven to Haridwar while en-route visit of Rishikesh, the 'place of sages' and a celebrated spiritual town on the bank of Ganga. Rishikesh is surrounded by Shivalik range of the Himalayas on three sides. Explore the famous Rishikesh temples and sightseeing like, Laxman Jhulla, Ram Jhulla, Bharat Mandir, Shivananda Ashram etc. On reaching Haridwar, check-in to the hotel and relax overnight after having dinner. Post breakfast, check-out of the hotel and get driven back to Delhi. On Arrival at Delhi, get transfer to Railway Station or Airport. Your Chardham Yatra ends here.